When there is a problem to be solved, how do you communicate as a leader? Do you focus on the problem at hand? Are you solution-focused? Or is it all about the result? Most leaders ultimately care about the results. They don’t care how it gets done but they want the problem to go away and to start seeing benefits immediately. 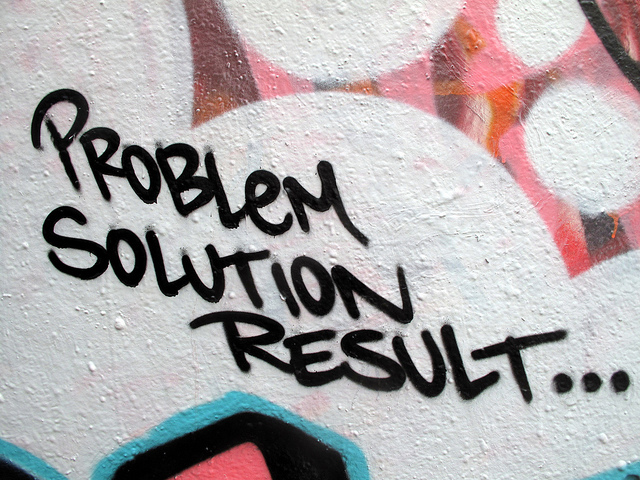 Many leaders are great problem-solvers, so they don’t hesitate to offer solutions. Having solutions already in mind is one way to see results faster. However, in a problem-solving situation, focusing your communication on solutions and results may not actually solve your problems. It is sort of like providing the right answer to the wrong question. When you’re leading a team of smart people with expertise in their fields, you may even be missing out on opportunities for them to contribute unexpected, better ideas. In other words, focus on the problem. Then leave your team space to find the solutions and achieve the results. As ideas are proposed evaluate them on how well they solve the problem, keeping an open mind that the best solution may not be the expected solution. As with everything, it is fair to set a deadline on when you need to move forward with a solution, even if it is not ideal. At the end of the day, it is all about results but you will be happier with them when they solve the real problem and your team was part of finding the solution. Diverse Teams: Are They Worth It? ← Do You Know Your Blind Spots?